Did Crystals from Ancient Lakes on Mars Form These Tiny, Weird Things? Dark, stick-shaped features that are about the size of a grain of rice, can be seen clustered on this Martian rock. This is a focus-merged view from the Mars Hand Lens Imager (MAHLI) camera on NASA's Curiosity Mars rover. It covers an area about 2 inches (5 centimeters) across. NASA's Curiosity rover on Mars found tiny, dark bumps on a Martian ridge that are similar to those found around gypsum crystals that form in drying lakes on Earth, according to a statement from the space agency. The tiny bumps are less than a half an inch wide. Some are star-shaped, while others are part of more complex V-shaped "swallowtails." The features are not crystals themselves, but could have formed over the crystals, like plaster over a mold. Researchers think the features are yet another sign that liquid water once flowed on the Red Planet. From NASA: "This composite image looking toward the higher regions of Mount Sharp was taken on September 9, 2015, by NASA's Curiosity rover. In the foreground ― about 2 miles (3 kilometers) from the rover ― is a long ridge teeming with hematite, an iron oxide. Just beyond is an undulating plain rich in clay minerals. And just beyond that are a multitude of rounded buttes, all high in sulfate minerals. The changing mineralogy in these layers of Mount Sharp suggests a changing environment in early Mars, though all involve exposure to water billions of years ago." Members of the Curiosity team are considering multiple possibilities for the features, which were found in Gale Crater, at a site nicknamed "Jura." The site is in a larger zone, called "Vera Rubin Ridge." The team is not sure when the crystal features formed, relative to when the sediments surrounding them accumulated. The crystals could have formed in wet sediment in a drying lake or in water trickling through the sediment underground, after it hardened into rock. It's also unclear whether the shapes contain the original crystal or mineral that formed them, or if those crystals dissolved away and were perhaps replaced by something else. "Some of the features shaped like gypsum crystals appear darker than gypsum, are enriched in iron, or are empty," according to the statement. (The "empty" features no longer contain the crystals that formed them). These are clues that the original crystallizing material may have been replaced or removed by later effects of underground water." "So far on this mission, most of the evidence we've seen about ancient lakes in Gale Crater has been for relatively fresh, non-salty water," Ashwin Vasavada, a Curiosity project scientist at NASA's Jet Propulsion Laboratory, said in the statement. "If we start seeing lakes becoming saltier with time, that would help us understand how the environment changed in Gale Crater, and it's consistent with an overall pattern that water on Mars became more scarce over time." Whatever the crystals' origin, team members expressed their surprise in running across them. 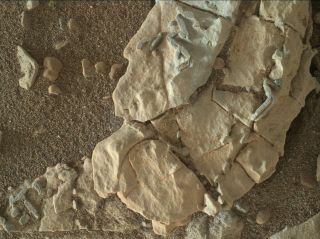 "These tiny 'V' shapes really caught our attention, but they were not at all the reason we went to that rock," Abigail Fraeman, a Curiosity science team member at JPL, said in the statement. "We were looking at the color change from one area to another. We were lucky to see the crystals. They're so tiny, you don't see them until you're right on them." Vera Rubin Ridge is located on the north slope of lower Mount Sharp inside Gale Crater. Curiosity landed in the crater in August 2012. It has been making its way up Mount Sharp since September 2014, examining the layers of the mountain to learn more about how it was formed. A mineral vein with bright and dark portions dominates this image of a Martian rock target called "Rona," which is near the southern, upper edge of "Vera Rubin Ridge" on Mount Sharp. "There's just a treasure trove of interesting targets concentrated in this one area," Vasavada said. "Each is a clue, and the more clues, the better. It's going to be fun figuring out what it all means." An image from Gale Crater taken by the Curiosity rover on Mars. The inset shows a v-shaped feature that may have formed over a mineral crystal. Curiosity began climbing Vera Rubin Ridge about five months ago and is now uphill on the southern edge. There, researchers are looking at features that could be linked to another transitional area farther up, called the "Clay Unit," because clay features were spotted in data taken from orbit. Researchers also noted that changes in the iron content in the ridge's mineral veins could have been important for potential life-forms that might have once called the Red Planet home. Different types of iron oxides vary in how well they dissolve in water. If an environment has many different types of iron oxides, that can provide a potential energy source for life-forms, NASA said.